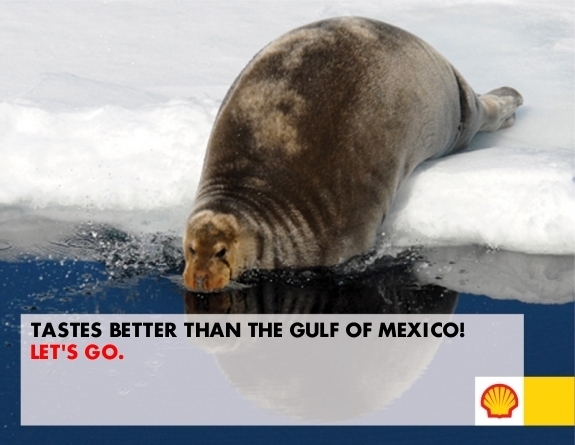 Social Media Attack: Shell “Let’s Go!” Arctic Campaign – It’s Fake! I didn’t come up with that poster. Keith did. He was a contestant in a social media campaign he thought was launched by Shell Oil. Keith was pumped. So was Tom. And Oliver. And Jane, Lisa, Zack and hundreds more. Each has used the campaign to send messages of derision to Shell. This is a communications professionals’ nightmare. And an environmental activist’s dream come true. The idea is simple. Prepare a website and have ordinary people write the tagline for their big advertising program promoting oil drilling in the Arctic wilderness. So up on a very authentic website they loaded a myriad of images with the Shell logo, then invited people to come up with catchy slogans. 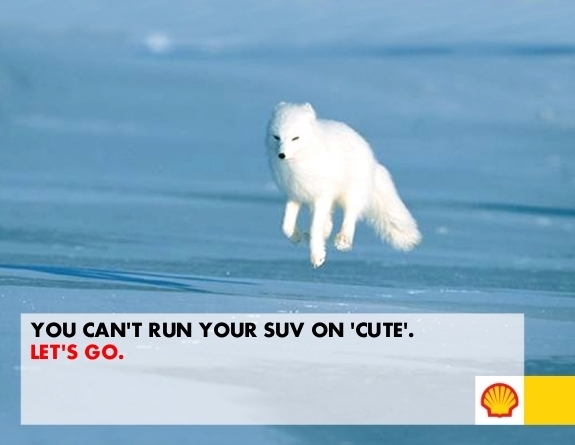 As expected, no one was “pumped.” So instead a series of anti-Shell ads have been created. And because there are easy-to-share buttons embedded in the campaign, all the negative images are easy to post to Twitter and Facebook. Others lace their comments with expletives. Alexis in St Petersburg asked if the campaign is a joke – then thanked Shell for providing so many useful images to teach students against oil drilling. With its “Blair Witch Project” quality the video was meant to convince viewers they were witnessing a real mini-oil spill – at a cocktail party. Problem is the entire event and video were staged. Later a fake press release was issued claiming Shell planned to sue the unknown person caught filming their event. These were so well planned that a number of reputable media organisations fell for the fakes. Countless consumers did, too. And given that they are still on YouTube more see the video and believe the fake story every day. “Recently groups that oppose Shell’s plans in offshore Alaska have posted a video that purports to show Shell employees at an event at the Seattle Space Needle. Shell did not host, nor participate in an event at the Space Needle and the video does not involve Shell or any of its employees. A fake press release claiming that Shell is considering legal action following the launch of the video was also distributed to the media. The challenge is real for Shell. They need to counter fake social media sites that are quickly grabbing share of voice among outspoken activists and day-to-day citizens alike. The problem is their “real” press release won’t be through legal before hundreds more create posters – and have their negative brand images cemented firmly in place. That said the fake site does provide Shell with a treasure trove of consumer research. Now they know why people dislike their drilling programs, the arguments they use against it. Perhaps with this insight Shell can create a verified social media campaign. Angry ‘Bergs was fun. this whole thing was fun. Yay activists!